Second-half goals from substitute Stephen Dobbie, Grant Anderson and Lyndon Dykes sent The Doonhamers through to the Quarter-Finals of the Betfred League Cup as Queens saw off Championship rivals Hibernian 3-1 at Easter Road. 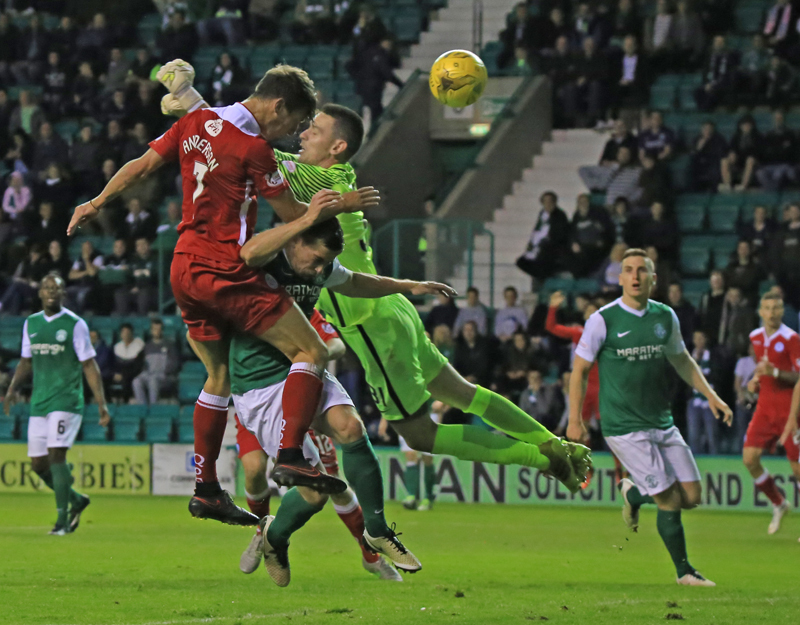 The Hibees got off to flier through a Paul Hanlon tap-in midway through the first period, but Queens did the damage in the last 25 minutes of the match. Inspired substitutions from boss Gavin Skelton seen sub Dean Brotherston link up with Dobbie for the equaliser, and the young winger cross was met by Grant Anderson to give Queens the lead late-on. Lyndon Dykes made sure extra-time wasn`t a possibility with a fine finish in front of the travelling support. Queens made two changes to the starting eleven who were held 1-1 at Tannadice on Saturday. Scott Hooper made his first start of the season, coming in for Jordan Marshall at left-back and Darren Brownlie replaced captain Chris Higgins who picked up an injury on Saturday against Dundee United. Stephen Dobbie remained on the substitutes bench alongside Steven Rigg and Callum Tapping. The last encounter between the sides at Easter Road was on the final day of the 15/16 Championship campaign when two second-half goals second-half goals from Niklas Gunnarsson and Jason Cummings made sure the points stayed in the capital. Cummings has been in hot demand south of the border recently, as English League One outfit Peterborough United offered £1 million plus to capture the 21-year-old but Neil Lennon`s side rejected the bid. And it was easy to see why Cummings is regarded as a hot prospect after bagging himself a brace in the Hibees opening Championship fixture at Falkirk. But it was Cummings strike-partner Grant Holt who had the first attempt of the match, after an even first ten minutes at Easter Road. Hooper brought down Keatings on the right and the fouled Keatings floated in the free-kick, the former Wigan striker rose the highest but could only nod it into the path of Queens goalkeeper Lee Robinson, who easily collected the ball. The hosts had another chance to break the deadlock five minutes later, when Kyle Jacobs brought down Marvin Bartley ten-yards from the penalty area. Keatings was again on the dead ball and fired his low strike straight at Robinson. Despite having the only chances of the match and beginning to dominate possession, Hibernian captain David Gray was the first man in referee Euan Anderson`s black book after a cynical foul on Dale Hilson on the edge of Queens` box. Hamill deemed to have fouled Cummings, just yards from the penalty area. The resulting free-kick from Keatings took a deflection on the way and was tipped onto the post by Robinson, but centre-back Paul Hanlon was first to react and tapped in from close range to give the Hibees the lead on 22 minutes. Queens nearly hit straight back but stand-in captain Andy Dowie couldn`t direct his header from eight-yards and went wide. Lennon`s side were hunting for their second and nearly had it on the 27 minute after nice work from the midfield the ball fell to Stevenson but his effort was saved by Robinson. The visitors were trying to get a foothold into match and started to worry the Hibernian defence. Grant Anderson did well to muscle off McGinn and his delivery from the right was not dealt with well by the Hibernian defence and had to knock it out for a corner before the lively Lyndon Dykes stepped in. Hamill swung in a deep corner-kick and Dykes beat Hanlon to nod the ball goal wards but was cleared by Liam Fontaine. Hilson broke forward and looked to have been fouled by Hanlon but the referee waved away his protests, the hosts counter-attacked which ended with Keatings who lined up a shot from 12-yards out but Robinson was at hand and saved. Hamill was booked for challenge on Gray on the left and Keatings whipped in another delicious free-kick, finding Liam Fontaine at the back post, but the centre-back fluffed his lines and missed from point-blank range. Another free-kick from Keatings but decided to try the spectacular and shot from 35-yards which went inches wide of Robinson`s left post. After a poor corner-kick from Keatings, Dykes broke forward into the Hibs half and was fouled by John McGinn, who picked up a yellow card. Before the free-kick could be taken Queens were forced into their first change of the evening. 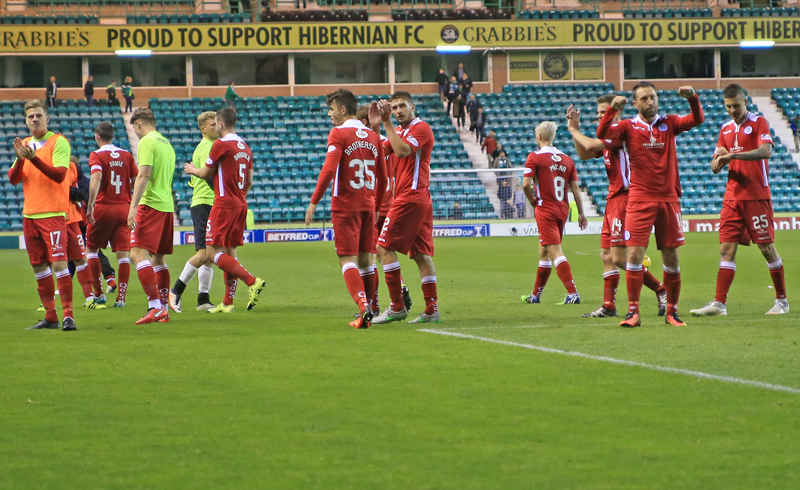 Hilson wasn`t moving freely and was replaced by ex-Hibee Stephen Dobbie, both sets of fans applauded the 33-year-old onto the field. Queens were beginning to settle into the half and it was Dykes who used his pace and strength to get past Gray on the left and get his effort on target but was collected by Hibs stopper Ross Laidlaw. Dobbie did extremely well getting past two defenders but his shot was blocked, only as far as Derek Lyle but he couldn`t add to his 97 goals for Queens as he skied his effort over the bar. The play was beginning to go from end-to-end and this time Robinson had to make a remarkable double save on 57 minutes, to prevent the Edinburgh side going further ahead. Stevenson`s powerful low strike was palmed away by the Queens keeper and immediately dived to his right to deny a fantastic strike from Keatings. Skelton made his second change of the evening, bringing on young winger Dean Brotherston for Hamill. And the sub made an instant impact, as Queens levelled the game on 66 minutes. Brotherston broke forward on the left and his low cross, found Stephen Dobbie and he slotted home his first goal since returning to Palmerston last Wednesday. The hosts were stunned but could have re-taken the lead when Cummings found space in the Queens box but fired a shot straight at Robinson on 71 minutes. Keatings tried his luck from long range three minutes later but got the same result as Robinson collected. With extra-time fast approaching, Dobbie skilfully got past two defenders and tried the spectacular from 30-yards out but dragged his effort wide. Queens were beginning to take control of the game and went ahead with eight minutes to go. Brotherston got the better of Gray and fired in a cross to the back post which found Anderson who leaped the highest and headed in for his first goal in Queens colours. The visitors didn`t sit back and sealed their last 16 spot, four minutes later. After great build-up from the midfield, Dobbie seen Dykes advancing in the box and cleverly played a through ball to the Aussie and he smashed it past Laidlaw in the Hibs goal, to the delight of the travelling Doonhamers. It was a fantastic second-half performance from Gavin Skelton`s men, with the introduction of Stephen Dobbie and Dean Brotherston seemed to give Queens an extra gear. The draw for the Quarter-Finals of the Betfred League Cup takes place tomorrow evening on BT Sport. Queens are next in action on Saturday at home to Ayr United, where a certain someone makes his second home debut. For a full gallery of photos from the match click here. For a video of the goals click here.